The Friday you get into school, the more your instructors will penalize you for writing issues. this includes bad formatting, poor spell checking, grammar mistakes, lack of fact-checking, even writing that's simply unclear or too verbose. now, some of this can only be corrected with attentive writing, and double checking your work. still, much of this can be covered with the right apps and tools. Our team has taken the time to look at a wide range of proofreading and editing tools. we've evaluated both free and premium tools, and those that offer both options. we tested these tools across a variety of platforms and browsers. it was a lot of work, but we have narrowed our selection down to four that we believe are worth a second look. if you are looking for tools to improve your writing, and of course your grades, keep reading. These maybe we'll worth adding to Your Arsenal. Grammarly is an extraordinarily popular spelling and grammar checker. Many students use the free, online version. They simply copy their text in at the Grammarly website. The site then analyzes it and points out any mistakes. This free version provides very basic grammar checking. The same level of checking is also available as a chrome plugin or as an add-on for MS Word. If you install the Chrome plugin, the tool will automatically check any text you write online. However, it is not compatible with Google Docs. There’s even a native app you can download to your desktop. This can be used whether you are connected to the internet or not. If you want more features, you’ll have to check out the premium version. These range between 11 and 29 dollars per month. The paid version contains many more checks than the free version does. While we love the free version, students who really need help with their writing will probably find it is well worth their money to pay for the premium version. Ginger Software is an English writing and grammar checking app. It works very well for ESL students who want to improve their English. It comes as a free Chrome plugin. The auto correcting feature is pretty impressive. It fixes your sentences as you right them. As we explored the tool, we realized that many students would benefit from the rephrasing tool. That is one thing that many ESL writers struggle with. Having this could help them immensely. There is a premium version that includes higher quality grammar checking and other features. You can opt to be billed monthly, quarterly, or annually. As you can imagine, paying annually will save you the most money. While this tool is intended for everyone, we especially urge students to check it out. We've asked for a promocode for our readers to make your visit even more enjoyable: 10DIS15. You can also receive a 40% discount if you purchase the premium version of this tool. Polish my Writing, also known as After The Deadline is an online writing aid. You can copy and paste in a document at the PolishmyWriting.com URL. There you will receive basic grammar and spell checking. The tool even gives you style suggestions. That last part is a bit unique, and not something we see with most of these tools. The tool is very simple to use, and free. If you are a coder, you might be interested in this technology as well. It is open source, and you are free to integrate it into your website, blog, or app. Try this tool out if you are doing any kind of self publishing. You might find it useful. 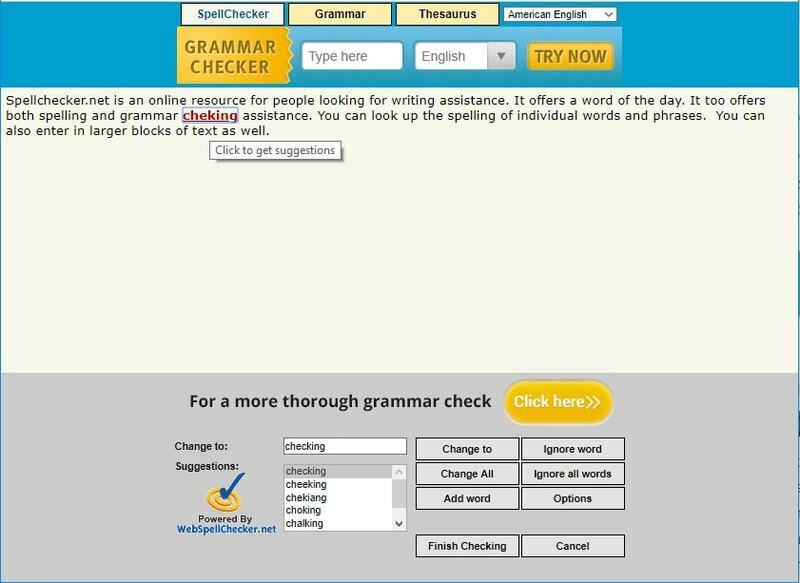 Spellchecker.net is an online resource for people looking for writing assistance. It offers a word of the day. It also offers both spelling and grammar checking assistance. You can look up the spelling of individual words and phrases. You can also enter in larger blocks of text as well. This tool is entirely, and worth checking out. Our only criticism is that the website is more than a little busy. There are a lot of ads. We’ve also learned that they have partnered with Grammarly. If you opt for more advanced features, expect to be routed to the Grammarly website. Don’t let your grades suffer because your writing isn’t as good as it could be. The tool hears are all worth a second look. Try a few of them out, and see which one works best for you. In the meantime, remember that tools are not a substitute for careful writing. In any case, polished writing is always a pleasure to read, and is most likely to get the marks you want on your written work. If you need assistance with any writing and editing work, please remember that we are always here to help.